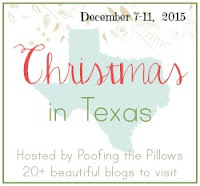 I am delighted to be included in the Christmas in Texas blog tour hosted by Stacey of Poofing the Pillows. Today I'm sharing our family's Christmas morning breakfast. Years ago, we began the tradition of serving a big breakfast at our house. At the time, our kids were the only grandchildren on both sides of our family. On Christmas morning, Grandmas, aunts, and uncles would arrive at our home laden with gifts for the children. It seemed only fair to have lots of yummy food ready for them. Now our own kids are adults, but we still enjoy this time together before we open gifts. The jute place mats were found at Walmart. 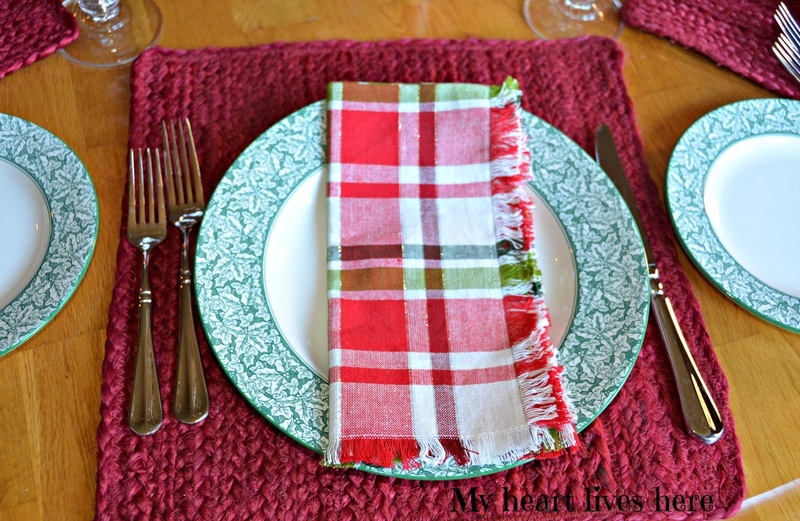 The plaid napkins are from T.J. Maxx. We've had the Spode Holly Tree dishes for many years. The centerpiece is simply a poinsettia in a white soup tureen. The plaid reindeer are Christmas tree decorations from Target. I just cut off the strings. 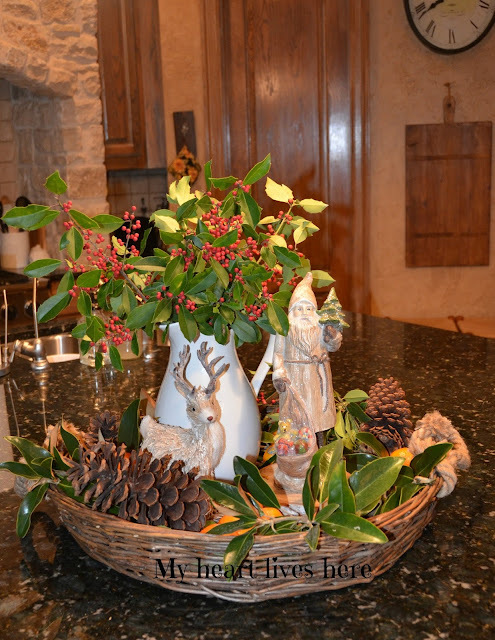 This year I decorated the kitchen island by putting holly and magnolia cuttings from our backyard in a pitcher. I added St. Nick, a reindeer, pine cones, and mandarin oranges in a large round basket. The basket is from Kirkland's. The pitcher is from Target. Breakfast is served buffet style on the kitchen island. The menu changes a little each year, but these are our two "must haves." I make the egg casserole on Christmas Eve, refrigerate it over night, and bake it for an hour on Christmas morning. I often see similar recipes using sausage, but my family loves this bacon version. These Danish Almond Cream Rolls are a big favorite. I found the Pillsbury Bake Off Finalist recipe years ago. I bake them on Christmas Eve. Then, on Christmas morning, I warm them up and drizzle the frosting on top. this year's new addition is a coffee and hot chocolate bar. The whipped cream is wearing a wine bottle sweater. 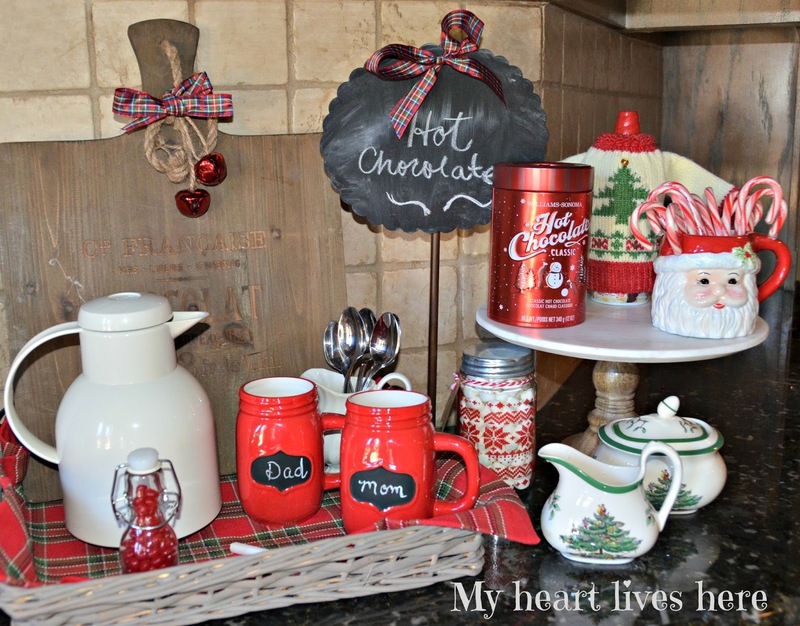 The red mugs, marshmallow jar, and bells were recent Target Dollar Spot finds. Can you have to much plaid at Christmas? I hope not. I used a Pier 1 place mat on the tray and plaid ribbon bows on the sign and cutting board. Day 4 of Christmas in Texas. Your Christmas breakfast looks so yummy, and it is great you can make this recipes the night before. Love your plaid napkins.... seems like plaid is popping up everywhere this year. Thanks so much, Judith. I'm on the way to check out the Christmas in Texas board on Pinterest. I love plaid so no you can't have too much. I love the Holly dishes. Gorgeous. I've never seen those before. I make a similar casserole and love it. It's nice to meet a fellow Texas blogger. Eilis, I love it all! Your kitchen is so pretty and goes right along with the rest of your house. I love all the little touches you've done and the breakfast sounds wonderful! 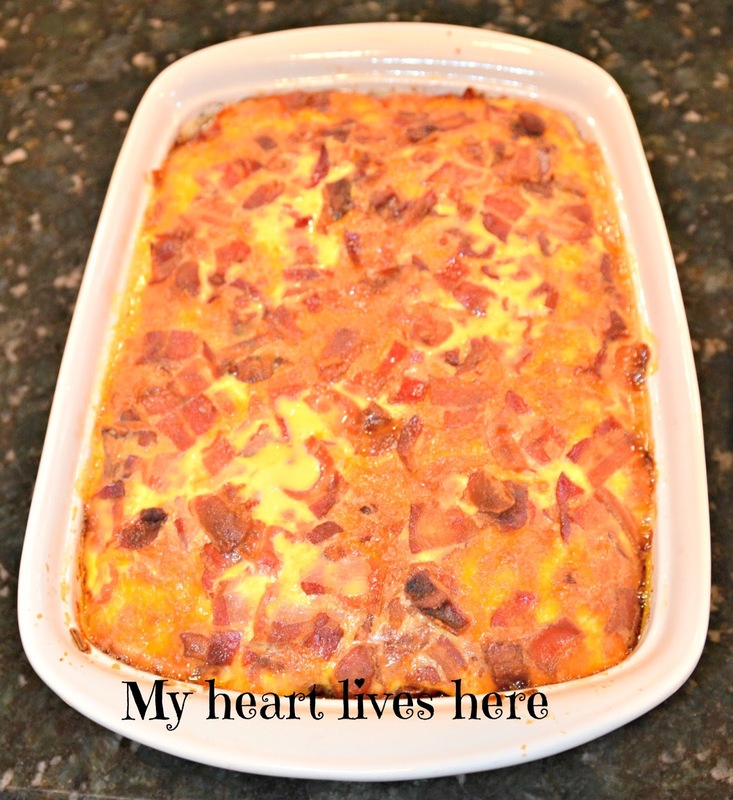 We love breakfast casserole with bacon too. I'm going to check out the sweet roll recipe...it sounds delicious. Thank you for all your planning and hard work! I am enjoying it very much. 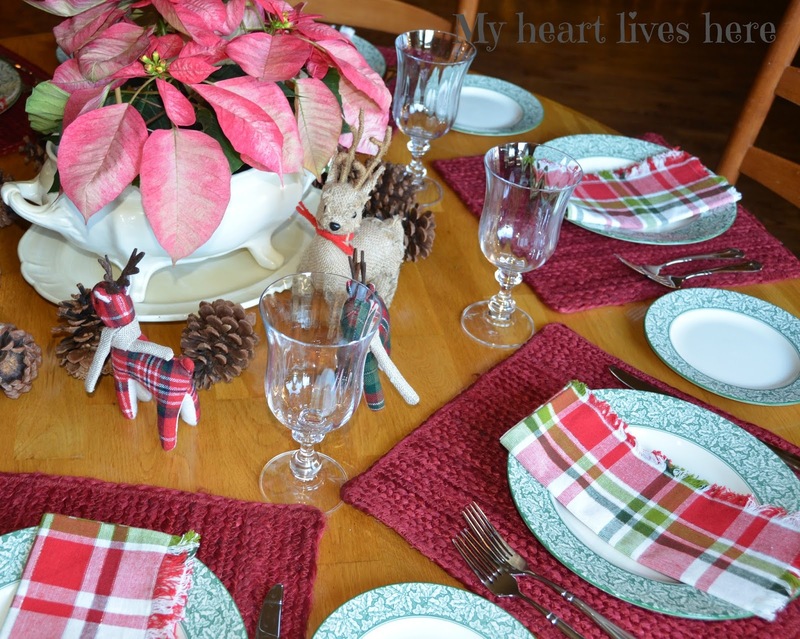 Hi Eilis, Your tablesetting and kitchen decor is beautiful. Beautiful special touches and the cocoa bar is awesome. Love the touch of plaid too. How special to have a breakfast tradition and your menu looks so good. Thank you for sharing the recipes. Merry Christmas Texas neighbor! Have fun on the tour! Thank you Celestina! I am loving the tour and being introduced to so many great blogs. Hi Eilis....this is all so festive and lovely! I simply adore your kitchen vignettes! 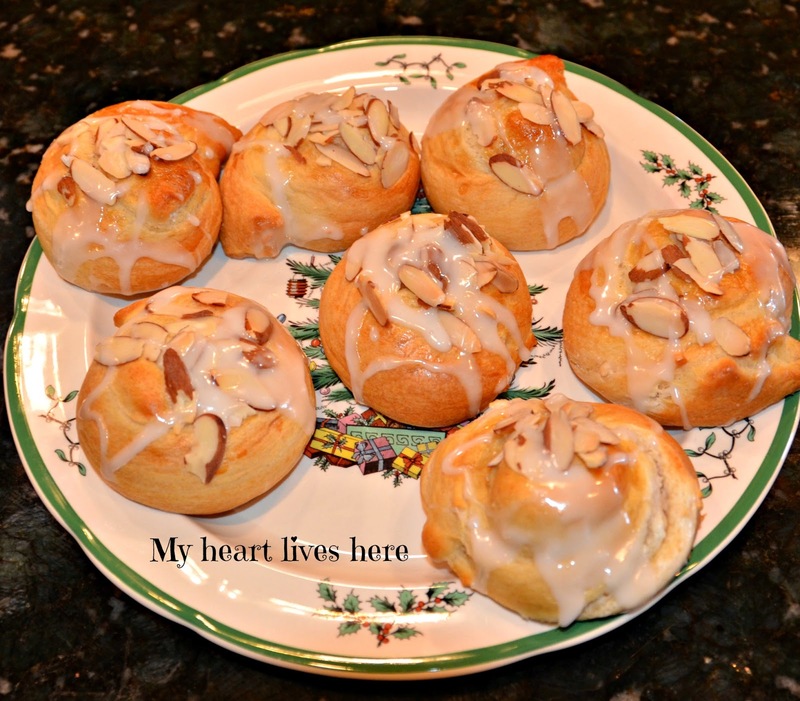 And...the almond rolls sound divine! Thank you so much for sharing your beautiful holiday home! Merry Christmas!!! 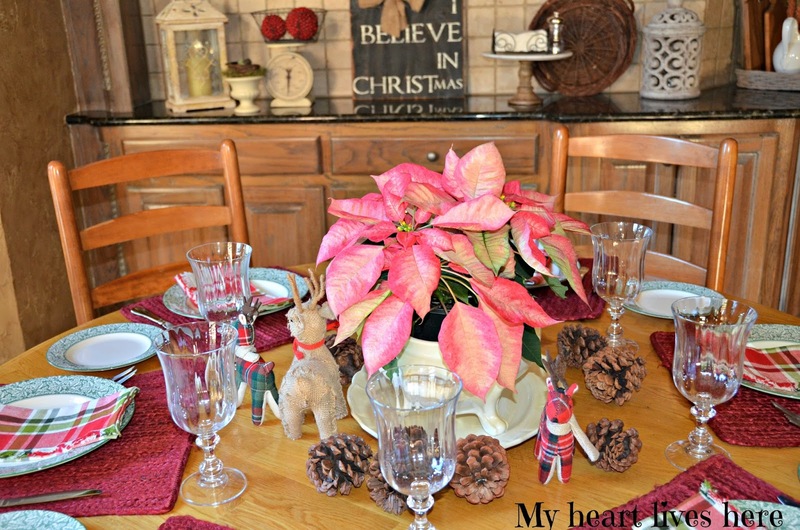 Your tablescape is so lovely! Plaid is always in but especially at Christmas! 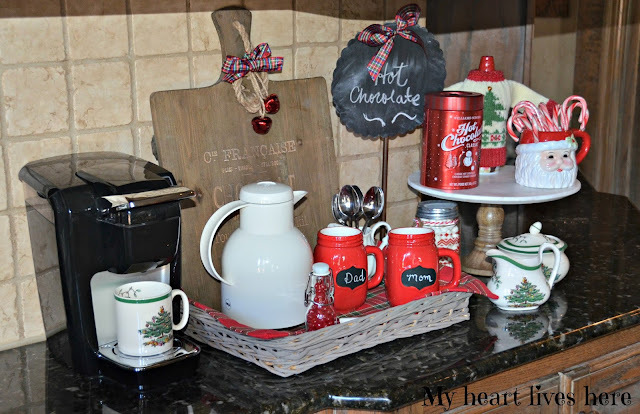 Your coffee/hot chocolate bar is such a sweet addition to your kitchen.I haven't been to Target in awhile and I can see all the goodies I've missed.Thank you for sharing your lovely home! PS I'm making a note of these yummy recipes! Thanks for stopping by Lisa. Looking forward to your post tomorrow! Christmas morning breakfast is a PERFECT way to gather for families! My siblings, our mother and as many of our children who can do this every year and then we have a Chinese Christmas Tree. We started this years ago so that would leave the rest of the day free for hosting or attending Christmas dinners of our own. Thank you for sharing your recipes! My printer is plugged in and ready to print up these so I can use them - in just TWO WEEKS!!!! Oh, my goodness!!! This month has flown by!!! Merry Christmas and I am your newest follower! NEVER too much plaid!!! I even like it (in other colors) year around!!! I am in love with the idea of using a wine bottle cover on the whipped cream. I have thought for years and never come up with a solution. (I've been using tinfoil as a cover :^( You are a genius!! Thank you too for the recipes. 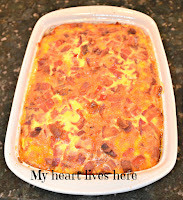 We will cook up the breakfast casserole over the holidays...yum! Thank you for visiting Jaybird! Those Danish cream rolls are seriously calling my name. I may need to bake these. Thanks for the recipe! My comment published before I was finished! I wanted to say how special it is to meet fellow Texas bloggers. I've enjoyed this Christmas in Texas blog hop. Love your idea to add the links at the bottom of your post. Going to do that now. Thanks for the idea! I agree, this has been a fun team activity! What a festive table setting and coffee bar you have! I love having a big breakfast on Christmas morning too. I have yet to make a breakfast casserole. Maybe this year will be the year. It's so nice to have it ready to go in the oven when you wake up. Everything looks lovely, Eilis! I've never thought about having a big breakfast for Christmas morning, but yours looks yummy:) We've always spent Christmas Eve with my husband's parents due to midnight mass, and then spend Christmas day with my side. So we have always had the traditional dinner, but I REALLY like this idea:) I'll probably need to postpone this until next year though because of my Grandmother. Thank you, Cindy. You definitely have enough to keep you busy already! I love plaid as well and you have made everything look absolutely wonderful and charming! We too have a big breakfast on Christmas morning and it just seems to set such a harmonious tone! 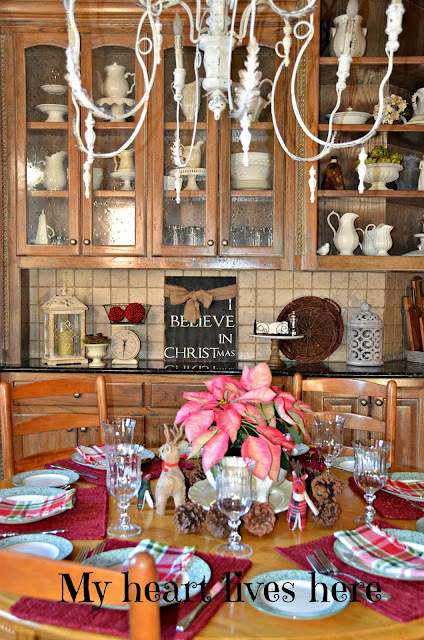 All of your special decorating touches are festive, classic and welcoming! I love the vignette on top of your kitchen island incorporating your beautiful magnolia leaves. You also have reminded me about breakfast casserole. I really should make one this year. I love your hot chocolate station too. I really enjoyed my visit! Thank you Susan and Bentley! Hi Kim, sounds like a great tradition to me! Everything is so beautiful! 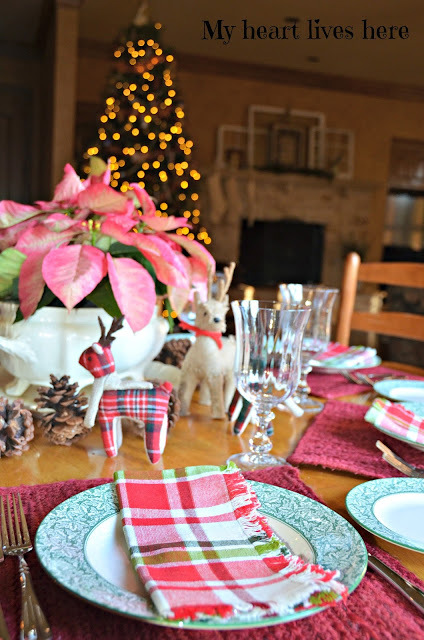 Your table looks festive and having Christmas breakfast is wonderful! We've always done that too and I make cinnamon rolls but form them into a wreath and decorate. :) Thanks so much for sharing the recipes! First I have to tell you I adore your chandelier! It is a dream of mine to own one in that style one day! Your table is so lovely! I pinned the picture of the basket on your kitchen counter....love! Your breakfast idea is a great one. My SIL does that with her side of the family and the grandparents and then we pick up my mother from there and take her for dinner at whichever home we are having it. A big day for Mum but she enjoys it, sees all of her family in one day. I love your Christmas Morning in Texas. Your home is so warm and inviting, it shows that your heart lives there. A great Texas addition to the tour! I love it all especially the Coffee and Tea station. Thanks for sharing at Home Sweet Home! Je suis française et je trouve votre table de fetes vraiment superbe. J aime beaucoup. Merry Christmas. Beautiful and so inviting!! We have a similar tradition in our family. We have fresh made cinnamon buns from an old BHG recipe---we make it and put it raw in the frig overnight and bake it in the morning. (I have also had to make some different ones for myself since the last 9 years I have had to go GF). We also used to always do an egg casserole dish. We have been trying to go off most meat except special occasions so I have not made it with the ham or sausage we used to have in it ;-). What a lovely tradition. I loved this post. Your table is so pretty and I love the hot chocolate display!Come over and link your post at The Count Down To Christmas party. You can link all your Christmas posts!